The aim of the group is to establish a network between the Mexican Professionals living in Switzerland, or people interested in the relationship between Mexico and Switzerland. We strength the community of highly-qualified Mexican expatriates while promoting the professional and personal development. We exchange experiences, know-how and provide support during the expatriation process, job search, local culture, career development, etc. We serve as a networking platform and reference point for the professional Mexican diaspora and Friends of Mexico. We seek to increase our professional network and reaffirm the positive image of the Mexican professionals abroad. The group platform is in LinkedIn in which you can share and have access to relevant information, events, jobs and contact other members. To meet personally and exchange experiences. 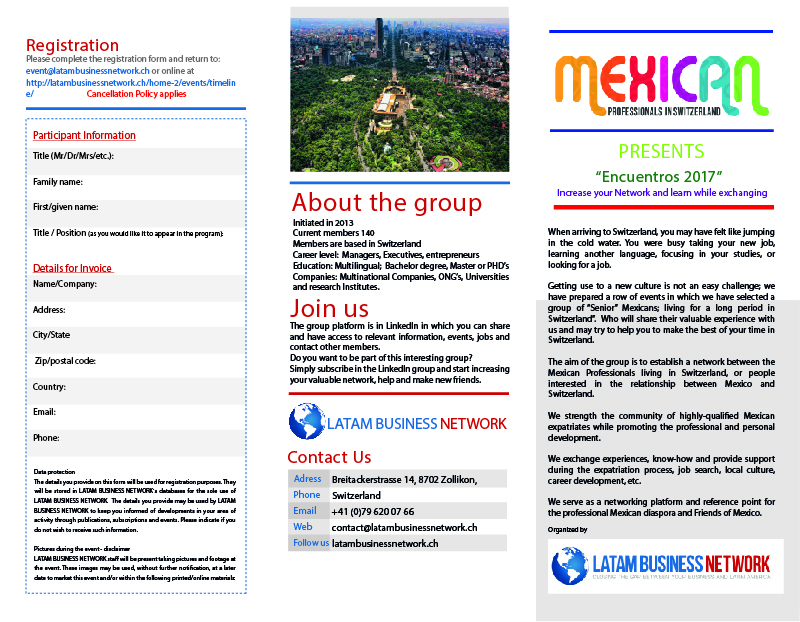 We organize “Encuentros” covering different cities in Switzerland so everybody can attend, and increasing your personal network. Do you want to be part of this interesting group? Simply subscribe in the LinkedIn group and start increasing your valuable network, help and make new friends. 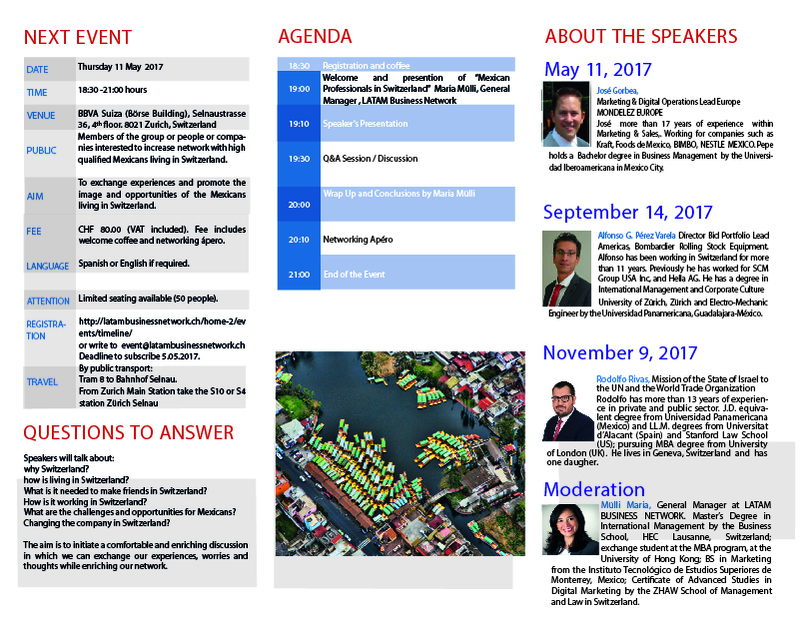 Speakers will talk about: why Switzerland? how is living in Switzerland? What is it needed to make friends in Switzerland? How is it working in Switzerland? What are the challenges and opportunities for Mexicans? Changing the company in Switzerland? The aim is to initiate a comfortable and enriching discussion in which we can exchange our experiences, worries and thoughts while enriching our network. November 9 deadline to register Nov. 3, as we need to follow a protocol to enter de WTO offices. Registration is required as space is limited. Please register before deadline. Cooperation Fee per event: CHF 80 (VAT included) includes welcome coffe and Apero Riche including wine. After registration, a cancellation is only accepted 10 days previous the event. You are free to send a replacement. Cancellation Policy: By submiting this registration, I am entitled to do the correspondent payment. For organization reasons, cancellations can be only accepted two weeks before the event, or a replacement can be sent.